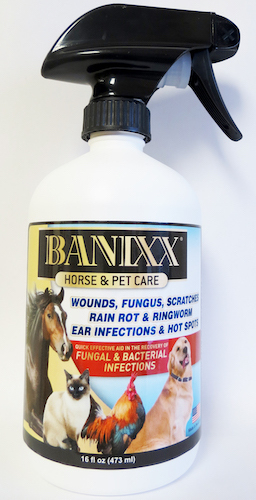 Banixx is a unique, safe and effective topical treatment clinically shown to kill the bacteria and fungi that cause hoof infections. It’s a very simple concept — control the pH with Banixx, then you control the infection! Our unique pH solution simply penetrates tissue creating a hostile environment for bacteria or fungi with no harm to healthy tissue. Be one of the first 10 professionals to apply and receive a free 8-oz. sample! TUF-FOOT is an antiseptic liquid blend of herbal extract and balsam that has been around since 1935. It aids in the prompt healing of stone bruising, thrush, hoof disease, sensitive frogs, close trimming, cuts and abrasions. It is an extremely effective analgesic and encourages regrowth and toughening of the sole quite quickly. TUF-FOOT should be in every farrier’s tool kit to ensure that horses’ hoof care needs are taken care of. Available in 7-oz. spray bottle. Stomps out the thrush on contact. Its staying power is incredible — so powerful that it lasts for up to eight days without reapplication, even in the wettest, muddiest terrain. Dramatically reduces the chances of reinfection. Use Thrush Buster not only to treat thrush, but to prevent it. Thrush Buster makes a horse more comfortable, a horse owner’s life easier and a farrier’s job more effective. SteriHoof Treatment Spray kills 99% of infection-causing germs. Clinically tested and proven at UC Davis Vet Med, SteriHoof’s patented formula is proven to effectively treat thrush, white line, hoof rot and other hoof infections. Many existing hoof treatments rely on chlorine, an ingredient that can burn, cause fumes and bad reactions. 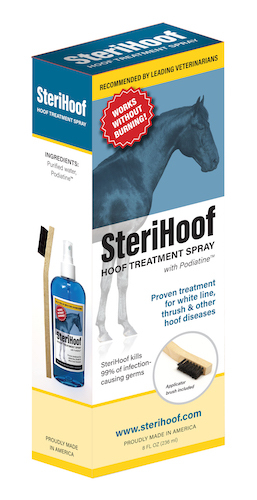 SteriHoof contains burn-free Podiantine™, a formula that works without unwanted side effects. Easy to use! No soaking required. Each SteriHoof bottle comes with its own easy-to-use applicator brush to reach deep down into crevices where germs can hide. And because it requires no soaking, it’s simple to apply for hassle-free daily treatment. Just spray and brush. 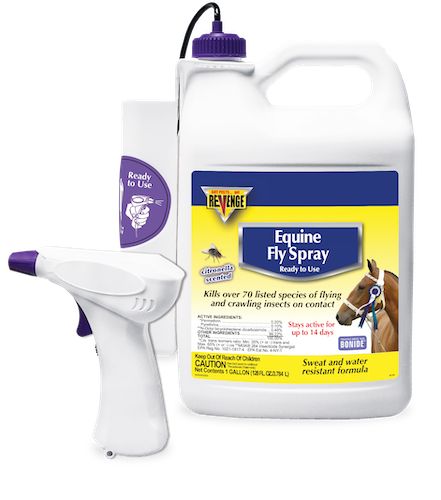 Revenge Equine Fly Spray is a combination permethrin and pyrethrin base with N-Octylbicycloheptene dicarboximde, synergist and citronella scent. This is a ready-to-use formula for direct spray or wipe applications on the animal or use as a premise spray. Brushing after application brings out a bright sheen on the coat. Rapid knockdown, kill and repellency of over 70 listed insects, including the Culex mosquito, which transmits West Nile Virus, and tick species that can cause disease. Formula is sweat resistant and useable on horses, foals, ponies and dogs. Available in qt. RTU, gal. RTU refill, gal. battery power sprayer and 1.33 gal. RTU with pump sprayer. Farriers love Spurr’s Big Fix Antiseptic Spray because they can simply spray it on the foot, wait a moment and trim a much more pliable hoof. 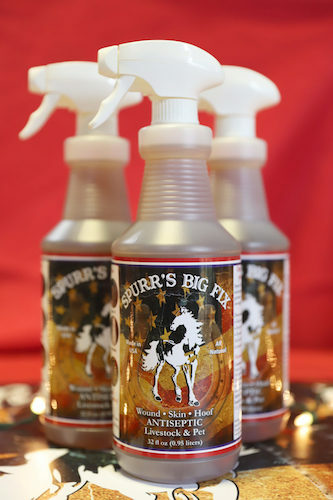 We all know the old saying “no hoof, no horse” and our Spurr’s Big Fix Antiseptic Spray is nothing less than miraculous when it comes to conditioning dry, brittle or cracked hooves! 100% Natural — made in the U.S.A.